Two and a half weeks till Christmas, if you still miss some gifts, now it's (almost) the final call to hurry up! My favourite gifts by far are accessories. While sizing makes the gifting of clothes a little bit tricky, accessories always fit and will satisfy the fashion lovers among your friends. I have only chosen my favourites of the favourites for this top ten; no wrapping paper can compete with their colourfulness. 1 Tropical Sunnies: Glasses fit for a true diva, hand embellished in pretty Melbourne. 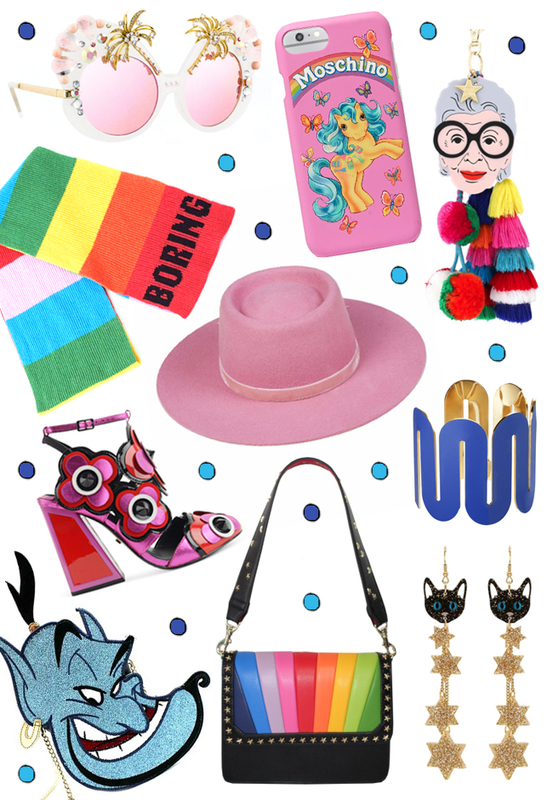 2 My Little Pony Phone Case: Because every girl needs Moschino in her life! 3 Iris Apfel Charm: Who doesn't want to go out with Iris and a group of pom pom? 5 Pink Hat: A beauty in the perfect shade of pink and from a label Lady Gaga wears. 1 Flower Shoes: Killer heels just perfect to make a grand show at any New Year's Eve party. 2 Blue Bangle: A cool statement bangle in the perfect shade of blue – Yves Klein blue. 3 Genie Bag: Christmas is Disney time and who doesn't need a genie? 4 Rainbow Bag: The maximum dose of colour you can put into a gift, I swear! 5 Cat & Stars Earrings: Nothing for superstitious girls, but for cosmic glitter witches.